If you intend to submit your app to the Store, you need to contact Windows developer support for approval to use flat bundles. 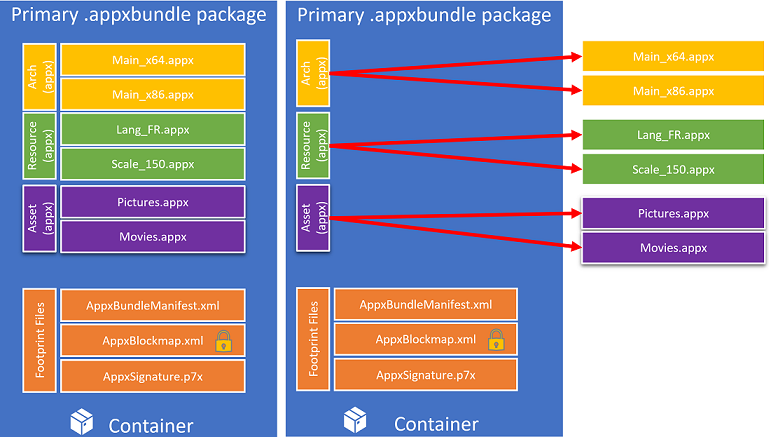 Flat bundles are an improved way to bundle your app’s package files. A typical Windows app bundle file uses a multi-level packaging structure in which the app package files need to be contained within the bundle, flat bundles remove this need by only referencing the app package files, allowing them to be outside of the app bundle. Since the app package files are no longer contained in the bundle, they can be parallel processed, which results in reduced uploading time, faster publishing (since each app package file can be processed at the same time), and ultimately faster development iterations. Another benefit of flat bundles is the need to create less packages. Since app package files are only referenced, two versions of the app can reference the same package file if the package did not change across the two versions. This allows you to have to create only the app packages that have changed when building the packages for the next version of your app. By default, the flat bundles will reference app package files within the same folder as itself. However, this reference can be changed to other paths (relative paths, network shares, and http locations). To do this, you must directly provide a BundleManifest during the flat bundle creation. A flat bundle can be created using the MakeAppx.exe tool, or by using the packaging layout to define the structure of your bundle. To create a flat bundle using MakeAppx.exe, use the “MakeAppx.exe bundle” command as usual but with the /fb switch to generate the flat app bundle file (which will be extremely small since it only references the app package files and does not contain any actual payloads). For more information on using MakeAppx.exe, see Create an app package with the MakeAppx.exe tool. Alternatively, you can create a flat bundle using the packing layout. To do this, set the FlatBundle attribute to true in the PackageFamily element of your app bundle manifest. To learn more about the packaging layout, see Package creation with the packaging layout. Before a flat bundle can be deployed, each of the app packages (in addition to the app bundle) must be signed with the same certificate. This is because all of the app package files (.appx/.msix) are now independent files and are no longer contained within the app bundle (.appxbundle/.msixbundle) file. Double click the app bundle file to install with App Installer. Use the Add-AppxPackage cmdlet in PowerShell and point to the app bundle file (assuming app packages are where the app bundle expects them to be). You cannot deploy the individual .appx/.msix packages of a flat bundle by themselves. They must be deployed through the .appxbundle/.msixbundle. However, you can update individual .appx/.msix packages of a flat bundle after the initial install. For example, if your v1 flat bundle is composed of an .msixbundle, an x86 .msix, an x64 .msix, and an asset .msix, and you know that your v2 bundle only has changes to the asset package, then you only need to build the .msixbundle and the asset .msix to be able to install the update. You must build the .msixbundle for v2 because the bundle keeps track of all the versions of its .msix packages. By bumping the version of the asset .msix to v2, you need a new .msixbundle that has this new reference. The v2 .msixbundle can contain references to the v1 x86 .msix and x64 .msix; the .msix packages of a flat bundle does not need to have the same version number.